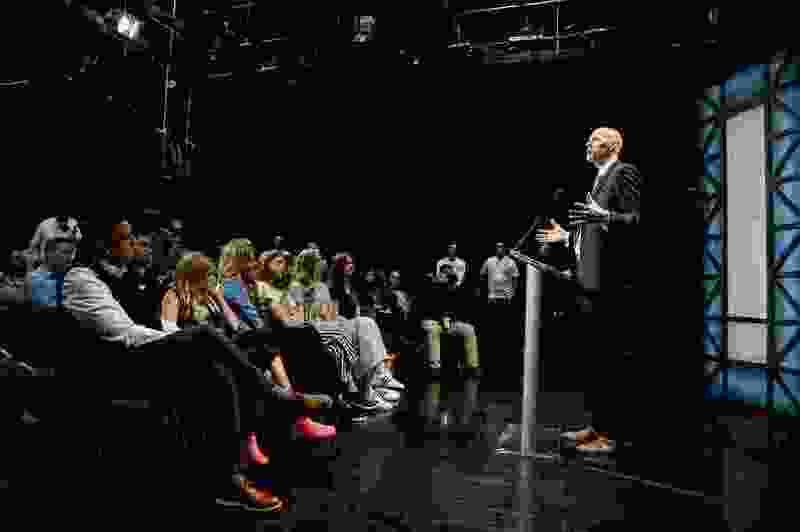 (Francisco Kjolseth | The Salt Lake Tribune) Mark Pope takes questions from the media after being announced as BYU's new head basketball coach during a press event at the BYU broadcasting building on Wed. April 10, 2019. All three of Pope's former assistants at UVU -- Chris Burgess, Cody Fueger and Eric Daniels -- attended the event and could follow Pope to Provo. Provo • Who will new BYU coach Mark Pope hire as his assistant coaches? That was the first question the former Utah Valley University coach was asked at his introductory news conference on Wednesday afternoon, and surprisingly Pope didn’t shrug off the pointed query as most coaches likely would have done. “I am already actually pretty far down the road with assistants,” Pope said, perhaps an indication that he was planning to take the BYU job all along, contrary to some media reports that he was dragging his feet a bit in hopes of getting a better offer. That probably means Pope is going to bring one UVU assistant, perhaps two or three, with him to BYU. His top choice is believed to be his second assistant at UVU, former Duke and University of Utah player Chris Burgess, who was with Pope all four years at the neighboring Orem school. A lot hinges on who replaces Pope at Utah Valley. Burgess will seemingly be a candidate for that job, but it is telling that Pope’s first assistant there, Cody Fueger, was named UVU interim coach Wednesday afternoon by interim athletic director Jared Sumsion, vice president for finance and administration Val Peterson and school president Astrid Tuminez. A 16-year coaching veteran, Fueger followed Pope to UVU from BYU in 2015. Pope would like Fueger to replace him as UVU’s head coach, according to sources close to the situation, and has asked some well-heeled boosters and friends to get behind that effort. Pope believes Burgess would have a brighter future at BYU (in relation to becoming head coach some day) than Fueger because Burgess is a member of The Church of Jesus Christ of Latter-day Saints, and Fueger is not. Burgess joked Wednesday that his former Utah teammates would give him a hard time if he donned BYU blue, but never ruled out the possibility. Meanwhile, Utah Valley is in a difficult spot because five-year athletic director Vince Otoupal resigned in February and now works for the University of Utah. Will Sumsion, Peterson or Tuminez — it is unclear who is ultimately making the decision — move quickly, or wait for the new AD to make the call? It might be Sumsion. ‘It is like nowhere else.’ Mark Pope is raring to go as BYU’s new men’s basketball coach. What about retired BYU coach Dave Rose’s former assistants? Second assistant Tim LaComb resigned when Rose did, while first assistant Quincy Lewis was a strong candidate for the job that went to Pope and made it known to BYU administrators during the hiring process that he wasn’t interested in any other coaching position at BYU than head coach. Third assistant Lee Cummard and director of basketball operations Andrew May would like to stay on the staff if Pope will have them. BYU athletic director Tom Holmoe said Pope will have total autonomy to choose his assistants, and doesn’t have to keep anyone on staff for continuity’s sake. Sources close to Lewis say he is very interested in the UVU job — he was an assistant there from 1997-2002 when it was known as Utah Valley State College. Lewis could also be a candidate for the vacant Idaho State job after the Pocatello school fired former SUU coach Bill Evans, 71, after seven seasons. Wasatch Academy coach David Evans might catch Pope’s eye, especially considering BYU is heavily involved in recruiting several of Evans’ players, including highly touted LDS prospect Caleb Lohner. Wasatch Academy assistant Paul Peterson, a former player and coach at BYU-Hawaii, has received some endorsements for an assistants job at BYU on social media by former players such as Brandon Davies and Kyle Collinsworth. Former players Luke Worthington and Nate Austin were slated to be graduate assistants in 2019-20 and are now also playing the waiting game, presumably.